PE (polyethylene) is the most frequently used plastic in the world. Its annual production exceeds 90 million tons. It was developed in 1933. This invention was essential for the development of modern plastic materials, which we cannot imagine our life without anymore. From the chemical point of view, the polyethylene structure is very simple, therefore it can be produced relatively in an easy and inexpensive way. According to its density, polyethylene is classified into two major types, so-called low-density (LDPE) and high-density (HDPE), the third type is the so-called linear low-density PE (LLDPE). Both PE types can be processed easily using plastic-processing technologies, and manufacture products of various shapes and sizes from them. In general, polyethylene has an excellent strength, high toughness, and ductility; products may be transparent or coloured with pigments. The common PE processing method is extrusion (2D products) and injection moulding (3D products). Flexible packages – bags for fresh and frozen food products, shopping bags, extensible foils. Solid packages – bottles for detergents and cosmetics, cans, barrels, large-size containers. Daily need products – minor kitchen dishes. Polyethylene may be recycled. It is widely present in the communal waste, therefore there are efforts to sort it (yellow container for sorted waste) and reuse. Non-woven textiles are plane or netted formations connected mutually by chemical, thermal, or mechanical processes. They are not formed by knitting or weaving. Non-woven textiles are very often made from polypropylene (PP). Non-woven PP textiles are formed by thin, several centimetres long fibres connected mutually by thermal reaction or adhesives. 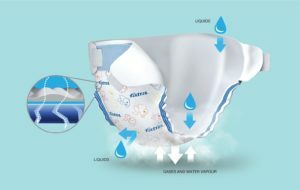 Sanitary means – baby diapers, incontinence diapers. Health care – disposable covers in surgical and other medical operations. 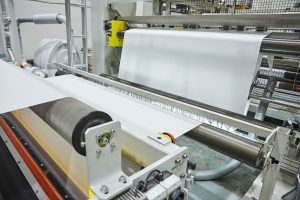 Automotive industry – thermal and noise barrier, filling materiál. Technical applications – geo-textiles, filtration. Agriculture – weed protection textiles, for mulching, etc. Fatra uses non-woven textiles as part of the water-proof Fatrafol 807 foil, and in the production of steam permeable laminates such as membrane and surgical cloth components. Breathable films Fatra Sontek® F and breathable laminates lamináty Fatra Sontek® L – suitable for use in the manufacture of disposable sanitary products – baby diapers, sanitary towels, incontinence pads, supplies for the chronically ill, or for other medical applications. Non-breathable laminates MEDICAL – suitable for production of disposable health care products including disposable surgical masks (surgical drapes), surgical sets, patient pads etc. Breathable laminates MEDICAL – suitable for manufacture of patient pads (protect the bed) and other applications. We would like to guide you virtually through the different breathable material production stages – extrusion, lamination, printing. We would like to present various cross-sectional views and diagrams regarding breathable films and laminates.